Glue two of the small craft sticks together in a V shape and then glue the third stick horizontally across the other two, about 1/3 of the way from the top. Attach the eyes with glue and then stick the pom pom on to create the nose. That’s it! 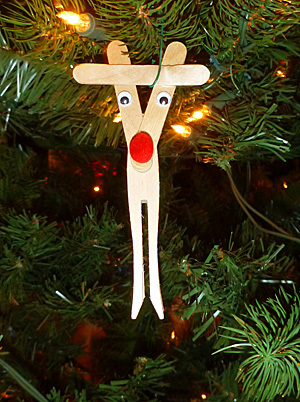 You’ve now completed your clothespin reindeer. To hang it on the tree, attach a red ribbon or use a large ornament hook around the cross stick. 4. (Optional) Tie a red ribbon around the reindeer to turn it into a Christmas tree ornament.